Atlanta is absolutely the best place to live during Black History Month. Events are scheduled throughout the month that celebrate the great contributions of African-Americans, both in the past and the present. Check the local paper for lots of inspiring events. My quilt From Africa to Atlanta by Way of Arkansas is a documentary of my life. It constantly reminds me to never forget what came before. This quilt is part of my African Canvas Memory Quilt series. The other quilts in the series of 100 quilts are posted online. 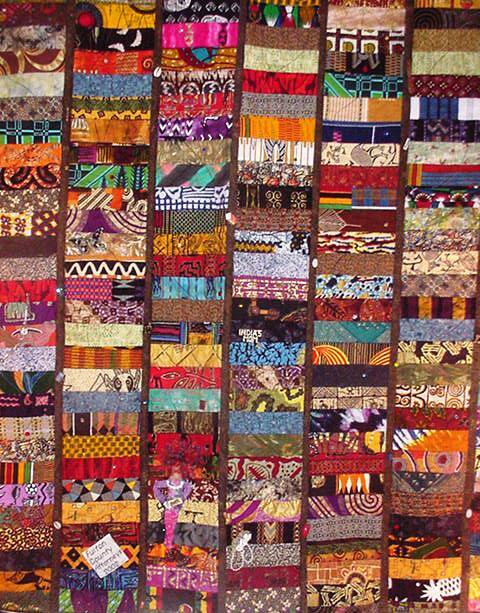 This entry was posted in A Quilter's Life and tagged African American quilter, African Canvas Memory Quilt, ethnic, fabric art, From Africa to Atlanta by Way of Arkansas, O.V. Brantley. Bookmark the permalink.